We had an absolutely wonderful weekend! Our plans had to be slightly modified in places, but isn't that always the case? I always seem to plan slightly more than I can physically accomplish! Anyhow, I thought I would share some of the highlights from the past week. On Thursday night, we met up with some of my family for dinner at a local Mexican Restaurant. After dinner, since the Mass of the Lord's Supper didn't begin until 7pm, we decided that it would be best for me to take our 3 youngest home and put them to bed, while hubby and our oldest boys went to church. It was a good thing too, since they didn't get home till well past 9pm! One of these years it will work out for us ALL to attend all of the Easter Triduum, but once again this was not the year. For breakfast on Good Friday we had the traditional Hot Cross Buns, followed by our Story time reading/craft and Stations of the cross. Hubby was home, so he read to the kids while I filled Easter eggs with way too much candy. This was NOT an easy thing to do on Good Friday, let me tell you! As usual it was very touching. It always brings tears to my eyes when the Priest enters in silence, and then prostrates himself before the altar. I also just love seeing the children venerate the cross. Even Father couldn't help smiling when Twinkle Toes got on her little tip toes to kiss the cross herself. It was so sweet & precious. Afterwards, when we came outside I couldn't help seeing all the beautiful blossoms, and get a bit excited that Easter was so near! When we got home, the kids placed our Caterpillar into his cocoon, and finished their Lenten activities. We all had a lovely Holy Saturday. The weather was absolutely beautiful--after much rain-- so the kids were able to play outside! 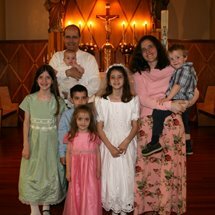 Then, my twin sisters, my youngest brother, and my cousin Juliana all came over to help us prepare for Easter! The kids were SO EXCITED! And I was very happy to have help with all the crafts so I could work on preparing clothing, baskets and food for Easter! We started with coloring eggs. Thankfully, I had remembered to have them pre-cooked and ready to go! After we were done coloring eggs, we got started on the candy kit. I was disappointed that I wasn't able to find any cross molds, like Dawn used... But the kit I ended up buying had a Spring theme, which worked out too. However, it was much more work than it had appeared, especially trying to make multi-colored candies. The boys quickly gave up and went outside to play with their uncle. Thankfully JoAnn didn't mind, and she stuck with it! They were having more fun than I was aware of... And so was my sister! I came in to help for a little while, but quickly gave up on making colored candy, and stuck with solid colors. Now THAT was very easy! The kids were very excited to show Grandma the eggs when she came back to pick up our helpers! After dinner, I came back to the computer to find a comment that walked me through watching EWTN LIVE online!!! I tried it out, and sure enough the Easter Vigil Mass at the Basilica in DC was just beginning! I couldn't believe it!! Here, all along, I didn't think we could ever watch EWTN without a TV! Thank you so much Elizabeth!!! We all were amazed, and then gathered around the computer to watch the Mass! It was beautiful! We then headed back to the kitchen to make our Resurrection cookies. I especially loved the kids reactions to smelling and tasting the vinegar! Twinkle Toes exclaimed, "Ooohhhh! Pooor Jesus!!!" after recovering from the taste. There wasn't enough time in the day to make our Easter Candle together, so after the kids were in bed, I quickly decorated our candle. I then got busy filling Easter baskets, making and then replacing the caterpillar with a butterfly, and setting the table--till hubby finally sent me to bed! And finally, Easter Sunday arrived!!! The kids got dressed for Mass, and then had a quick peek at their Easter baskets as we headed out the door. Thank you again to my dear sweet cousin Juliana who once again sent the girls a couple beautiful dresses to wear!! They fit perfectly, and looked so darling!!!! Mass was beautiful, and Father Carmello's sermon was wonderful! On the way home hubby & I headed straight to our favorite coffee drive-thru!! My mocha with chocolate macadamia nut flavoring and whipped cream was just heavenly! Once home, our dear friend Joan and I got busy making breakfast while the kids dove into their Easter baskets! It took Chiquita a few minutes to wake up from the drive home, but only a few. Snuggles LOVED his first Easter! It rained on and off all day, so the kids had an indoor Easter Egg hunt this year, after shouting "Viva Christo Rey!!" After a short nap for everyone! :) We headed to Rascal's godparents home for dinner. It was a full house with over 40 people--and more than half children!--but we all had a wonderful time! Kristin is quite the hostess, and the tables looked beautiful! And here is one last picture of Snuggles with his daddy!! He was a very happy baby all day long! for the 50 days and beyond!! WOW you had a very eventful Easter. Loved the pictures. YOu all look so beautiful, Happiest Easter blessings to your sweet sweet family! What wonderful memories, Jessica! I love the picture of your hubby reading to the kids, so sweet! Happy Easter! Christ is risen! Alleluia! Awesome pictures! Your children are so cute. Hahah those picture are so cute! Maybe next year we'll try some easier candies haha.